Hoare's Yard was a yard alongside and behind the Railway Inn in Middle Street. Today the yard is the site of the eastern half of Wetherspoons' William Dampier and much of Central Road at its junction with Middle Street. It had earlier been known as Foot's Yard in reference to Samuel Foot who had been the licensee of the Railway Inn between about 1889 and 1891. It was known as Hoare's Yard after George Hoare, licensee of the Railway Inn from 1899 until the Railway Inn was demolished in 1913 for the building of Central Road. He was landlord of the new Railway Inn, built on the site of today's Wetherspoons, and remained licensee until his death in December 1929 at the age of 76 - a total of thirty years as licensee. 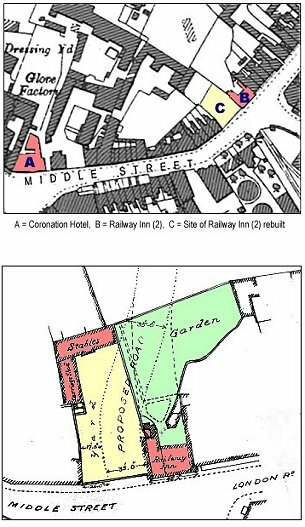 Of course Hoare's Yard, shown in yellow on the map at left, disappeared in 1913 with the building of Central Road. Nevertheless the large yard was the site used for small circuses and fairs, for travelling performers to put on popular entertainments. or 'Penny Pops' or 'Penny Gaff' as they were commonly called locally. One such was a performance recorded on a travelling theatre notice of the New Star Theatre in 1885 and illustrated below. The shows would have been under a marquee or awning or, perhaps, sometimes in the open air. The yard itself contained a carriage shed (about 40 feet long by 18 feet deep - 12.2m x 5.5m) and a separate stable block (about 55 feet long by 18 feet deep - 16.75m x 5.5m). Behind the pub was a large garden (coloured green). The frontage of the yard on Middle Street was 57 feet (17.4m) across and its depth was about 140 feet (42.7m). A large L-shaped garden was to the rear of the pub, some 78 feet (14.6m) deep and about 90 feet (27.5m) at its widest part. In January 1908 the Western Gazette, in reporting a Town Council meeting wrote "There were two applications from travelling theatres for licenses to stand for three months in a yard at the bottom of Middle Street. A lengthy discussion followed, several members being against the granting of the licenses, and complained of the nuisance that existed when the theatres had stood there on former occasions. On the other hand, it was argued that no complaint had been made and there was a certain section of the community to be catered for. (So, Councillors were pompous, supercilious and condescending even then - nothing, apparently, changes) Ultimately the licenses were granted for two months. Mr Beer remarked that he thought he could guarantee good behaviour at the place, and he believed the people would give him a free ticket after saying that. A member: Perhaps a box seat (laughter)." As a footnote, chemist Thomas Maggs used the windows of the Medical Hall in the Borough to exhibit various fossils and skeletons he had collected. These were displayed below an array of brightly-coloured chemist's jars - the insignia of his trade. The Western Gazette carried a series of letters in the 1930s in which people recalled earlier Yeovil and one correspondent remembered seeing the skeletons of a cat and a rat displayed in Maggs' window which had been found during the demolition of the "old dressing yard carried on in Foot's Yard". Apparently, it was claimed, that the cat had chased a rat deep into the foundations but the hole became narrower and narrower and eventually both rat and cat died. 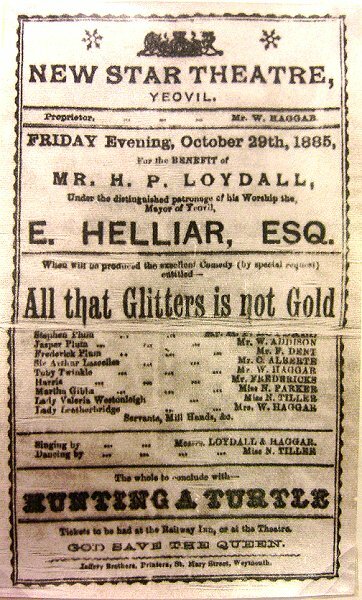 A notice of the New Star Theatre, the original being printed on silk, for a performance in 1885. Notice towards the bottom of the notice "Tickets to be had at the Railway Inn, or at the Theatre".